If we are honest, we know that we men are not that good at “coming away…to a deserted place” to “rest a while.” In fact we know that over 80 percent of us check our smart phone even before brushing our teeth in the morning, and spend time on it in the last hour before we go to sleep. Like the apostles, we focus on getting a lot done. But let’s imagine what would happen if we truly responded to the challenge of Jesus to “come away” to pray in solitude every morning, resting in His presence and holy Word. Jesus invites us to put first things first. Let’s take him at his word and make the changes we need to make. This month I challenge you to “come away” to a quiet place by praying at least five minutes a day, first thing in the morning before you check your electronic devices or turn on the TV. You will likely have stops and starts, but strive to be as consistent as possible. Secondly I challenge you to respond to Jesus’ invitation to “rest a while” by doing something truly restful on Sunday, the day of rest. Following the challenge you and your brother Knights (and any interested parishioners) should gather to discuss your experiences. Prayer: Come Holy Spirit. We thank you for guiding our lives and pray that we may have the courage exemplified by Venerable Fr. McGivney to live our faith to the fullest through our council, our families and in society. May our words today give glory to your Sacred Heart and if we struggled this past month in living our faith, help us to never stop turning to you and always try again. 3. Invite the men to talk about what it was like to try and live last month’s challenge from the Supreme Chaplain. Prayer: Heavenly Father, we thank you for this time together with our brothers. We ask you to have mercy on all those people and intentions we prayed for. 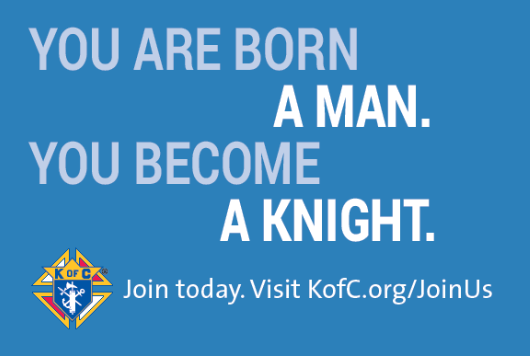 Give us the perseverance to live next month’s challenge and to remember that we are united with our brother Knights around the world in doing so. NOTE: As a rule the State Deputy does not use any electronic device (computer, tablet or cellphone) for the purpose of playing games, to Facebook, etc. after 12 noon on a Sunday as to pause for “family” time. The only time that the cellphone is used is to check an occasional email or text for emergency purposes as necessary for the position. The 2019 Cash Calendars have been printed and were distributed at the District Deputy meeting on the 30th of June. Additional calendars will be sent to those that were not in attendance. Please do not wait until all calendars are sold before returning. Any remaining calendars not sold by 01 Dec, please return to Ron so others that may want more can receive them in time. INCENTIVE: If the total amount of calendars sold exceeds $20,000, the Top 5 councils that sold the most will receive a 10% return. REMINDER: The income generated received from this vitally important project significantly assists the overall budget of the Maine State Council. Thank you for assisting us in this endeavor. During the trip to New Haven, the Supreme Council updated the Faith in Action Program regarding “Youth”. Although they allow for a Youth Director on the State-level to assist the Community Director, there is no “Council-Level” Youth Director. Therefore, here in Maine, appointing a State Youth Director would mean that this brother Knight would not be able to conduct business at the State Convention like the other Directors would. “SAVE THE DATE” for this special bus trip that is scheduled for 8 & 9 Sep 2018. Cost of the trip is $350 per couple or double occupancy or $250 for single occupancy. See below for the itinerary. Board the bus for the return home. Arrive in York late afternoon and arrive in Old Town mid-evening. Council Officer Duties and Responsibilities Training. Fraternal Training Sessions are conducted live and then available on-demand at a time and place convenient to individual members. Thank you, and thanks to your council, for what has been done to help those in need! Register and Attend our convenient online training. This webinar is open to all, and especially all council, district, chapter, diocese, regional and state council officers. Please share so everyone has the opportunity to participate!! GORHAM—A rosary rally will be held on the lawn of St. Anne Church, located on 299 Main Street in Gorham, on Saturday, July 14, at noon. Youth members of the parish will lead the praying of the rosary at the event. In addition to parishioners, non-Catholics and people who have never prayed the rosary are also encouraged to attend. Volunteers will offer rosaries and guidance for anyone interested. The event on Saturday is the latest organized by “Maine Needs Fatima,” which hosted six outdoor rallies in 2017 to commemorate the 100th anniversary of the appearance of Mary to three young visionaries in the town of Fatima, Portugal. Over 100 people have gathered at the rallies which have taken on different looks from month to month. For instance, May’s rally featured an outdoor Mass and, in June, a procession from the University of Southern Maine to the front lawn of the church preceded the rally. Another procession is scheduled for the August rally and an outdoor Mass is set for the October gathering. Information on how to participate in the “challenge” will be available at Saturday’s rally and next week on the initiative’s website (link below). In addition to the rosary rallies and “challenge,” the initiative has grown to also include a “First Five Saturdays” program at St. Anthony Parish in Westbrook that features the opportunity for confessions, a rosary recitation, and Mass. The Kaspryzks are also offering in-home visitations with the Fatima statue. A website to promote the initiative (www.maineneedsfatima.org) will livestream the rally on Saturday. The livestream will also be available at www.facebook.com/maineneedsfatima. To learn more about “Maine Needs Fatima” including a schedule of future rallies, visit the website or call (207) 615-0575. Editor’s note: Abanaki Councill 334 also scored space on SeacoastOnline. See their article here. On December 18, Abnaki Council 334 conducted the first ever Nativity Celebration at the Maine State Capitol Hall of Flags in Augusta. This celebration marked the first time in Maine’s history that a Nativity was placed on State of Maine property. The Nativity set was donated by the American Nativity organization, which strives to place a nativity set in every state capitol and this was also the first time the Knights of Columbus have ever placed a Nativity in any US State Capitol. Governor Paul LePage spoke about Christmas memories, Council 334 also announced the winners of the Keep Christ in Christmas Poster Contest and the Catholic Citizenship Essay Contest. 3 choirs performed – St. Michael School from Augusta, St. Dominic Academy Elementary Choir and the Mt. View Chamber Singers. State Deputy Norm Gray closed the ceremony with remarks indicating the significance of this event to the State of Maine, the Knights of Columbus and the Catholic Church and all Christians.